Most of the projects on this site are created with a cup of coffee immediately in reach, and my favourite way to make coffee is with an Aeropress. 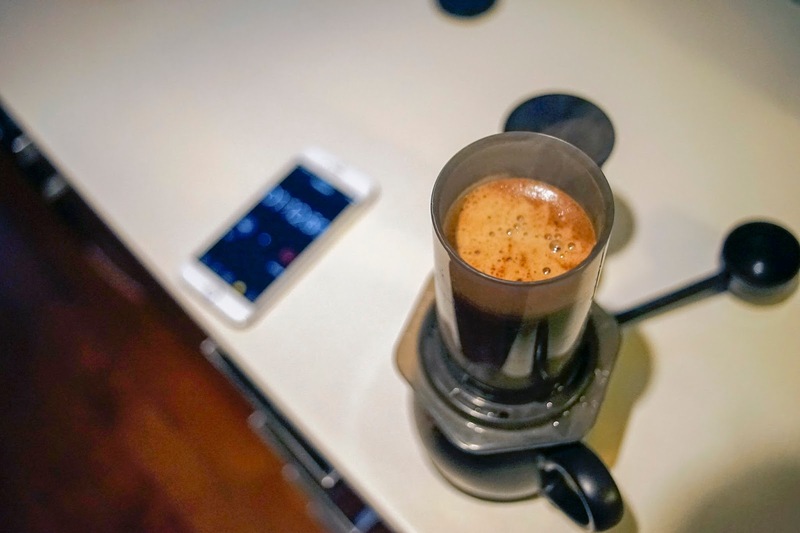 This device is sort of a hybrid between French Press, and Espresso. It was also created by Aerobie, inventor of the world famous SuperDisc Frisbee! There are already hundreds of recipes online, many with a cult like following. 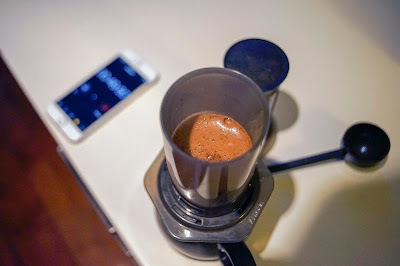 Checkout some of the winning recipes from the World Aeropress Competitions, featuring advanced techniques like "the turbulent wiggle". After hundreds of experiments of my own, I've abandoned the inverted method for what I call the Turbo Press. This is my favourite way to extract a large cup of coffee with a full bold flavour. 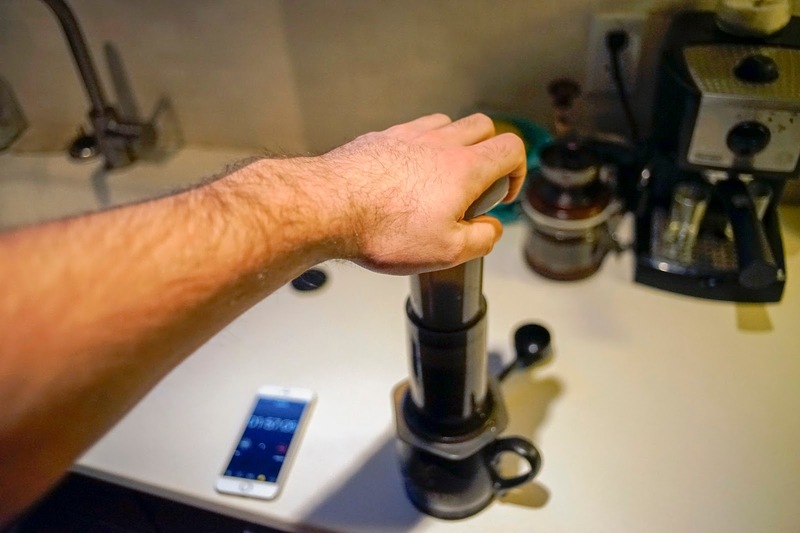 Get a medium to large cup, with a volume of roughly 1.5 Aeropress chambers. Fire up the kettle, and freshly grind your beans for a paper filter. In step 8, you should have to push down with the force of an enraged child. If it's too easy, grind finer. Wet a paper filter and place it in the Aeropress over your cup. 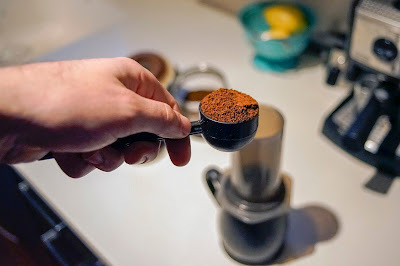 Fill with one heaping Aeropress scoop, and turbulently wiggle your Aeropress so the grinds are flat. Stop the kettle before it comes to a full boil. If you have a whistle kettle, stop it when it starts to sputter pathetically. Start your timer, and pour just enough water to cover the grounds. This is called "The Bloom", as it was created on set of the Lord of the Rings by Orlando Bloom. Let this sit for 30s as the grounds expand. With a thin circular stream of water, fill your Aeropress to half way or the "2". At this step, we are looking for a thick creamy froth on the coffee. Wait another 30s, and then fill all the way to the "4". We're hoping for a froth with time-to-flip-the-pancakes bubbles here. Insert the plunger but do not press. Pull up ever so slightly to introduce negative pressure. Wait until the two minute mark, and press! Some stop when they hear the "hiss", but I don't. 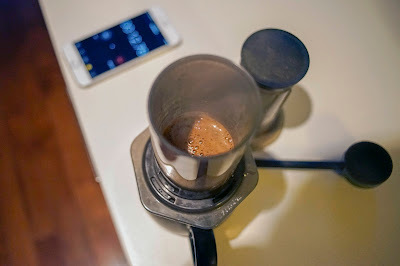 If you want stronger / more bitter coffee, wait longer than two minutes. Press down with the force of an enraged child. If it's too easy, use a finer grind. Enjoy your coffee, and start experimenting to find your perfect recipe! you are one funny man, ben eagan. From the Vault: Arduino Night Writer.